We are a conflicted lot – we often vacillate between moments of grieving sorrow and bursting joy, between moments of profound love and moments of intense hostility, between moments of deep faith and moments of critical doubt. And I don’t think it’s because we are bi-polar. It merely speaks of our imperfect human condition, a contingent existence where so much depends on our present yet temporary condition and surrounding circumstances. The apostles were certainly not immune from this predicament. They too vacillated between exaltation over the miracles they had witnessed and misunderstanding and doubt. Toward the end of St Matthew’s Gospel, which I’ve just read, and right before the passage called the Great Commission, you’ve heard that the eleven disciples saw the Risen One in Galilee, and the gospel makes this seemingly puzzling observation of seemingly contrasting, even contradictory actions: “when they saw Him they fell down before Him: but some hesitated.” The sequence seems disjointed. Most other translations use the word “doubted,” a shocking alternative to the more ambivalent “hesitated”. The very event that was intended to both proclaim Jesus’ resurrection and set forth Jesus’ Great Commission seems compromised by this intrusive statement about doubt among the eleven closest disciples. Some commentators would explain this seeming contradiction by reminding us that in St Matthew’s account of the post-resurrection story, we do not have the reports of the two disciples on the Road to Emmaus as in the case of St Luke or the first hand encounter with the Risen Lord in the Gospel of John. For all purposes, in St Matthew’s Gospel, apart from the women who returned from an empty tomb, this was the first time the Risen Lord had appeared to them in person – thus the explanation for their doubts. We can’t be too sure that this was the reason for their doubting and hesitation. The laconic words of the Gospel say nothing about the nature of their doubts. But the Apostles’ doubt makes their state closer to that feeling familiar to anyone striving to find a conscious faith grounded in understanding, and yet continue to be beset by doubts. To add further puzzlement to the mystery, it’s interesting to note that the word “some” which appears before “hesitated” or “doubted” doesn’t appear in the Greek. It’s just not there; it’s been added in the translations. A more direct translation is “seeing him, they worshipped and doubted” or perhaps, “worshipped but doubted.” With the addition of the word “some,” it makes the verse sounds as though there were two groups of disciples: the good ones, those who worshiped without doubt, and the not so good, those who doubted. But in the original Greek, what the text really states is that they all worshiped and they all doubted. Which leaves us with this question, is it possible to believe and doubt at the same time? NO!!! I mean, YES!!! Absolutely not! It is, too! If two people were having this conversation, it would be tense...If this were a conversation between me, myself and I...well, that’s just scary! Yet, how often do we find ourselves in this actual predicament. My Myer-Briggs Personality test reveals that I’m a typical INTP type, and one of the most distinctive characteristics of this type of personality is self-doubt – I’m constantly busy debating with myself, doubting the correctness and the veracity of my thoughts, actions, decisions and conclusion. Examining my own experience, which I do not believe that I am peculiarly alone in this, I’ve come to realise although I can honestly say I believe in God, I have to admit that there are certainly times when I doubt; doubt that I am really speaking to God, doubt that God is actually in control of the whole situation or doubt that, given some situation I’m facing, God really loves me or knows what He’s doing. These conflicting forces of doubt and believe best summarises the “little faith”, which is the hallmark of St Matthew’s theological understanding of the meaning of discipleship. The disciples are often confronted by Jesus himself for their “little faith,” which does not imply the absence of faith at all, but a reminder that faith by its very nature cannot be reduce to mere certainty or cocksureness. Remember, the opposite of faith is not doubt – the opposite of faith is certainty. Faith contains doubt, faith implies doubt or at least the possibility of doubt – certainty neither allows doubt nor requires faith. It’s important to note that the Greek word for “doubt” as Matthew uses it in the passage is not disbelief, but rather wavering belief – being of “two minds” – in other words, the absence of certainty. And we know this to be true from our own experience. 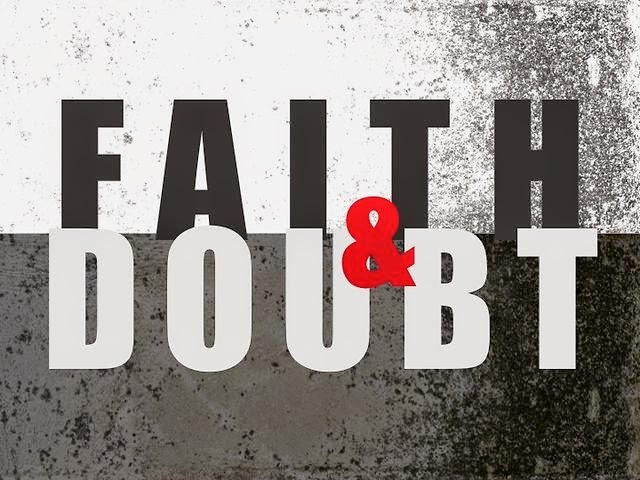 For most of us, faith and doubt often seem to go hand-in-hand. In a way, this puts the emphasis back on God to do the work in us. We can muster up all the belief in our heart, soul and mind, but without God’s help to do so, it will never be enough. For if faith is equal to certainty, there will never be an element of trusting God and allowing God to do what seems impossible to us or even at odds with our designs and plans. Once persons accept that they are both strong and weak, hardy and frail, capable of moments of shimmering faith and times where all seems lost, then they can relax, breathe, and trust in God’s faithfulness and providential care. Thus the same elements of worship, doubt and a little faith inhere in the Church even after Easter as before. It is not to angels or perfect believers but the worshipping and wavering community of disciples, both saints and sinners alike, that the world mission is entrusted. It is heartening therefore that such a mission to share in the authority of Christ, to evangelise and proclaim the gospel, to enlist and make new disciples into a witnessing community, to sanctify through the sharing of sacramental life and finally to hand on faithfully the teaching of Christ, is entrusted not a rock solid faith-filled Church made up of perfectly impeccable members, but to one which is filled with those who often waver in their faith and who struggle with what little faith they possess. It is consoling and encouraging for us to know that we don’t have to be perfect, to possess rock-solid faith without a shadow of doubt, to be absolutely certain of our convictions and vocation to carry out the mission that Christ has imparted to us. Indeed, He has done this despite our many foibles! At the end of the gospel of St Matthew, Jesus does not ascend. That seems utterly ironic especially when this is the gospel chosen for Year A of our Lectionary Cycle for this Solemnity of the Ascension. The significance of his Ascension is seen in the parting words of Jesus, “And know that I am with you always, yes, to the end of time.” His last words are a promise of his continuing presence during the Church’s mission. After the Ascension, our motley crew of worshipping and doubting disciples returned to the sanctuary of the Upper Room, led back to the place where the Church is born, to the place where these disciples will receive the Paraclete, the Holy Spirit. And it is here, in the Church that we too must pursue our mission and find our peace. The Church, despite all appearances, remains the gateway. We need a community who heals, yet we are deeply fractured by our sinfulness. We need a community to strengthen our faith, although we continue to vacillate between belief and doubt. We need a community that continues to make present through the Sacraments and the Word the promise of Christ, “I am with you always, yes, to the end of time.” And because Christ is present in and with and through this community of broken people, a community of the spiritually bi-polar, that we are healed.